Don Knotts guest-starred in a few Scooby-Doo episodes, which I suppose the “forces of darkness” didn’t like. 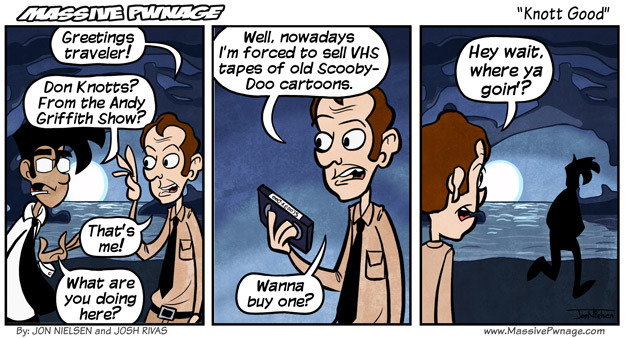 Being the Scooby-Doo haters that they are, they condemned Don Knotts to an eternity of selling old copies of those episodes. Don’t ask me where Locke gets these ideas. This entry was posted on Monday, February 8th, 2010 at 12:00 am and is filed under Comics. You can follow any responses to this entry through the RSS 2.0 feed. Both comments and pings are currently closed. Lol. I laughed pretty hard. I finally get the background on this one!!! KH2, woo! !